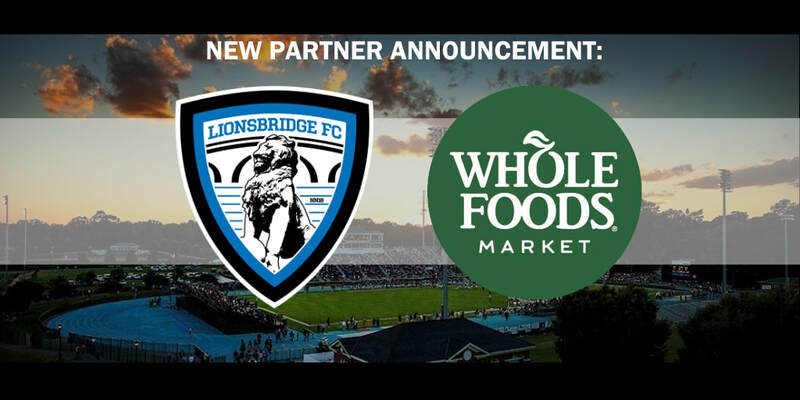 (March 20, 2018) – Lionsbridge FC, the Peninsula’s new PDL soccer team that kicks off in May at POMOCO Stadium, and Whole Foods Market announced a wide-ranging partnership that will provide soccer fans with additional opportunities to celebrate throughout the season. Starting in April, fans will be able to buy Lionsbridge FC single game tickets and team in person at Whole Foods Market’s Tech Center location in Newport News, online at LionsbridgeFC.com or at POMOCO Stadium on match days. The partnership will also include a contest where fans can win a Lionsbridge FC/Whole Foods Market Memorial Day BBQ package for 10 people, exclusive ticket contests on social media, and special promotions for fans of all ages at the Newport News Whole Foods Market. Whole Foods Market will extend its popular weekly “Wing Night” in celebration of Lionsbridge FC home matches. From 12-7pm on the day of every home Lionsbridge FC match (schedule), fans will be able to purchase wings for 35 cents in the Oyster Pub located at the Newport News location in Tech Center. Fans can also pick up Whole Foods Market cakes and cookies featuring Lionsbridge FC logo and decorations. “We’re thrilled to partner with Whole Foods Market, a company that is committed to our community. Their involvement will help make Lionsbridge FC match days an even more exciting occasion. Together, we will be able to create awesome experiences for our community,” club co-founder Mike Vest said. “We are proud to support Lionsbridge FC and enhance the fan experience during its inaugural season! Not only will the team bring excitement to our soccer fans, but the stadium on game day will be a gathering spot for the whole community," Whole Foods Market’s Newport News Marketing and Community Relations Liaison Amanda McDaniel said. Whole Foods Market joins an extensive network of Lionsbridge FC partners that includes Chick-fil-A, Riverside Regional Medical Center, Nike, Tradition Brewing Company, Mosquito Joe, K9 Off Leash Dog Training, Kona Ice, O’Doodledoo’s Donuts, All-Pro Tactical, Vinny’s Pizza, Kwolity Productions, Parkway Printshop, Clancy and Theys Construction Company, Animal Medical Care Center of Yorktown, the law firm of Jim McNider and Onelife Fitness, as well as numerous area youth sports organizations such as Baystars FC, Churchland Soccer League, Newport News Parks & Recreation, Premiere Sports, Smithfield Soccer Club, Suffolk FC, Tidewater Sharks, Upward Sports in Hampton, Virginia Legacy Soccer Club, VIP United and Yorktown FC. Lionsbridge FC season tickets are available for purchase and the 9-game home schedule opens May 16. Lionsbridge FC will play its home matches at POMOCO Stadium on the campus of NCAA Division III powerhouse Christopher Newport University. Each home game will be preceded by a two-hour pre-game community festival complete with the Tradition Brewing Company Sideline Lounge, food trucks, bounce houses, music and family entertainment. The Premier Development League (PDL) is the top pre-professional league in North America and consists of more than 70 teams across the U.S. and Canada, functioning as Major League Soccer’s primary developmental and player showcase platform.